Super Mario Clone World 1-1 Playable Demo! I finally got a demo of world 1-1 finished and here it is for you to enjoy. It is now 32k. With 32k I believe I'll be able to fit 16 levels (World 1-1 through 4-4). Each end world will have a Koopa kid as the boss. For those that played the pre-demo version, you already know that it's not exactly like SMB, but it is pretty close. You automatically get what's in the bonus yellow blocks. The flagpole is also smaller and I did this because I wanted to be able to put it in strategic areas not on ground level in order for you to have to figure out how to get there to finish a level. I also changed the program so it only has one enemy on the screen at one time. I did this because it was proving too difficult with limited cycles and RAM to keep swapping and keeping track of stuff. However one is popping up all the time, so it might seem like there's more than one at one time! There is one exception. 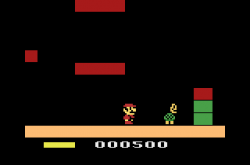 When you kick the turtle shell, it'll turn into a moving playfield block which allows for an enemy sprite to come on so you have the ability to knock the shell into something besides a brick. I wanted that to at least stay true to the real game. I'm still trying to figure out how I should implement the star power in the game. I also EXPANDED the levels! Each level will now have 2 scrolling screens worth instead of 1. 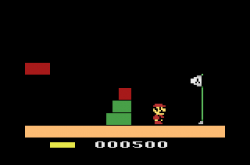 You will see a pipe to go down at the end of the first half of a level, then when you go down it, you will come back up in the 2nd half of the level to finish it. This was my way around the limited 256 byte data level lines. In the demo you'll keep playing world 1-1 until you lose all your men for now. The collision detection with the playfield blocks isn't 100% perfect, but it's close. Still something I have to work on if I have the cycle time to. So, have fun, and yes I included music and sound effects. To start level, press fire button at intro screen (That shows world level and lives). Move left or right to move left or right. Press the fire button to jump. Press Up to run and to shoot fireballs if you are FireMario. Press Down to duck or to go down an open pipe. To finish a level, run into or jump on flagpole. The higher you land on it the more points you will get. The status bar on the left of the score is your timer. Don't let it run out! The status bar on the right of the score is your coin counter. It will go up one block every 8 coins. At 64 coins it will reset and you will earn an extra life. Going down the mid-level pipe also acts as your checkpoint, so if you die you will continue where you came up from the pipe. Yellow blocks are bonus blocks. Smash them to get a coin or power up. Red blocks are bricks. When big you can get rid of them by smashing them. You can go from Mario to Super Mario to Firey Mario. Vice versa when stunned by an enemy. The BAS file is the soource and the BIN is the program to run on an emulator of Harmony Cart. Edited by Sprybug, Fri Aug 17, 2012 2:08 AM. Freakin' awesome! Somehow the controls feel better (than previous builds). I'm not sure if that's intentional or the PC I'm on. It does kinda look like Maryo is peeing giant green boogers instead of fireballs. Maybe ice blue would provide bettter visibility and yet be dissimilar enough? Edited by theloon, Sun Aug 12, 2012 11:57 PM. I think you know as well as I do that you're stuck with the ball being the same color as the playfield row that its on, so I have no control over what the "fireball" color will be. You'll notice that the color of it will change depending on what row the ball is on. The control is virtually the same as the previous demos, maybe now that it's a full playable demo it just seems the way it is. As for the music, I also have a musical background and I found the sheet music for all the levels and sounds on a website. I went into the music / sound editor in VisualBB and composed it using that. I used the data it provided and made changes as I needed to when I put it into the program. It was difficult to do because you have a limited amount of notes available to you depending on the tone, so as you listen to the music you may notice that the tone changes here and there to be able to pull off certain notes. I also had to be a little creative on the musical score as sometimes the G note wasn't available no matter what tone I used. You may have missed it in the directions I had listed, but in there you press up to run. 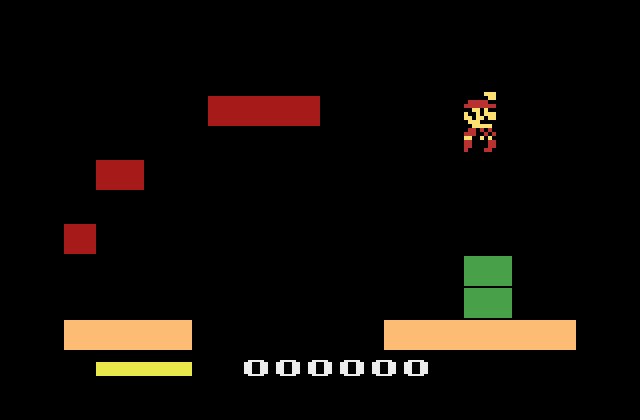 When the screen scrolls, it's hard to tell that he's running because I could only scroll at a minimum of 4 pixels (playfield blocks are 4 pixels wide). I tried doing it once at 8 while running and it was way too fast, made the scrolling less smooth and he could sometimes run through stuff he should not have been able to. However, you will notice the difference in the length and height that he jumps when do you run. That's the biggest benefit of it. You could move this over to DPC+ to get a real fireball and coin blocks. That sounds very tempting. Is that the new beta version 1.1, or is it something new altogether? I thought about trying the new beta and was scared away finding that it was still pretty buggy. I wonder if my current code would even work on it. Thoughts? If it worked it sounds like I could do multiple enemies and real kicked shells too. My god this is awesome!!! Count me in for a cart when complete!!! Oh! I just did a little research, DPC+ takes advantage of the hardware enhancements of the Harmony Cart. Well, as awesome as that sounds, I want to be able to make a game that could be produced on a stand-alone cartridge. This doesn't mean that nobody can take the existing code and port it over to add DPC+ capabilities. It's one of the many reasons why I posted the original source code. So people can not just maybe learn from it, but also make it better and perhaps port it over to take advantage of the Harmony Cart. As you know, I'm not done yet, so if anyone has that idea, I'd hold off until I get a full version working, because at this point the code isn't set in stone and I may make even more changes by the time I'm finished. Great game - only 31 Levels to go! You've done some amazing things with the standard kernel, and upgrading it to DPC+ would be really cool. The only problem is that there are no playfield commands (like turning playfield blocks on and off) with the current release, so you might as well continue development with the standard kernel for now. 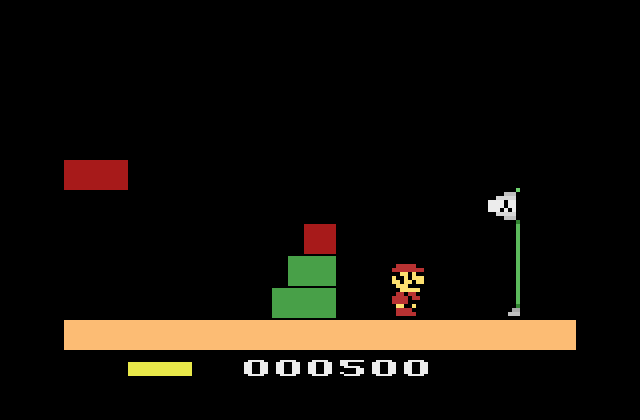 DPC+ games can be produced on a stand-alone cart via the Melody board. The music is perfect too - again, great job! This is awesome! Controls feel great, music sounds way better than I would ever expect, and the game just flows. Can't wait to see more. Great job so far! I has a nice feel to the game. As written by others, a DPC+ version would be a nice idea (no blank lines, better resolution...). I am waiting the final version of DPC+ bB to improve my L.E.M. game. Near everybody has Harmony cart and you can produce carts using Melody boards. Edited by Philsan, Tue Aug 14, 2012 4:39 AM. Can't run it ATM, can some post screens? Can't wait to try this! Music is great, very fun to play. I'm not a programmer so I don't know if my suggestions are doable but maybe I can help. 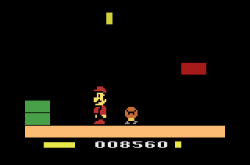 1)When you jump over an enemy and keep button pressed, Mario should jump higher. 2) Crouching is cool to see but the only gaming advantage of it happens when you can slip when you stop running by crouching. Good players can access places by crouching and slipping even when the Mario is big. But I understand that slipping may be difficult and sometimes a bad thing too. Maybe Mario should slip only when running and then crouching??? Just my two cents. The game is already awesome I look forward to buying a cart! You have some good suggestions. I'm currently adding a few more bonuses to the game right now, and will definitely add the bounce jump off of enemies. That'll actually be really easy to add. As for duck sliding, that's one of the reasons why I wanted to have ducking primarily, so you can run duck and slide, and it is doable, just very hard to accomplish because you have to press up to run and then quickly press down to slide under lower blocks before running into them and ending up stopping. You'll see another benefit of ducking later when in later levels, you encounter the likes of Bullet Bill and flying turtles. As for the bonuses I am working on, I'm adding secret items in brick blocks at the moment which will allow you to get 8 coins, an extra mushroom, OR the starman power. It can happen at any red brick block, but only when you are big. The time that one will pop out of a smashed block will have to be something you figure out, but it will be rare and because of the time limit on the level, you won't have the time to go smashing every block just to get bonuses. This will help keep getting bonus items to a real low minimum. Like the real game! Someone make a youtube, I'd like the hear this as well. Thanks for the screen shots BTW. In the first post there is a rom you can play in emulator or with the harmony cart. Don't say me you don't have any of them? Nope, just a stored away at the moment CC2. Anyone got a youtube vid of it yet? Okay, give me a little time. I've got to finish my work that I get paid to do, then finish the update I am making to this, which is halfway there, and then when that is finished and posted, I'll see if I can get a video made up. Never used software to capture the screen for video, so we'll see how that goes. I can do a YouTube video of it. In fact, I'll have it up in about 15 minutes or so. Thanks! Wish I had the latest update available to show off a little more, but I appreciate it. I'm just way too busy to take the time to figure out how to do video on it and post it.